Oak Ridge community is sold out and is not in active development by builder. 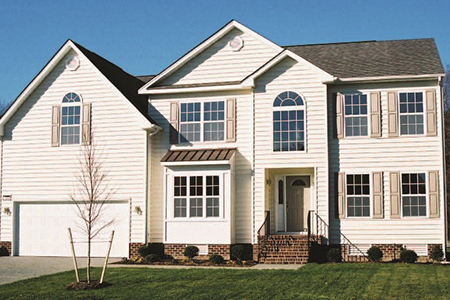 If you are interested in Oak Ridge or similar new home communities, contact us today! Our agents are very familiar with new and newer construction in Yorktown, and can identify resale opportunities in Oak Ridge, as well as builder inventory available in nearby or similar communities in Yorktown. To view 6 more pictures, interactive maps and the full, detailed description of the Oak Ridge community, please Login. Houses for sale in the new construction real estate development, Oak Ridge, provide the total package. Finding a new home here will be about as difficult as finding a bee in a hive. Traditional design details combine with modern features to give today’s buyers the houses they want at affordable prices. Conveniently located along the border of Newport News and York County, VA, this neighborhood gives residents a perfect home base in Hampton Roads. Military members can quickly get to Naval Weapons Station Yorktown, Joint Base Langley-Eustis and the Coast Guard Training Center Yorktown. This new construction development is noticeably different. Houses for sale in this real estate complex are ideal for moving into right on the spot. Each new home in Oak Ridge may feature 30-year architectural shingles, covered front porch, maintenance-free siding, rust-free gutters and downspouts, satin nickel finish entry locks, yard irrigation system, wrought iron rails, sodded front and side yards, custom mailbox and more. Buying a new home comes with many decisions. Here in Oak Ridge, buyers have so many options with these houses for sale that decision-making can be fun. Every new construction home here may include wainscoting, hardwood flooring, granite kitchen countertops, 42-inch custom cabinetry, Delta faucets, two-car garage, ceiling fans, recessed lighting, crown molding, chair rail and so much more. When it comes to real estate standards, the builders here have set the bar high. This part of southeastern Virginia is not only stunningly beautiful but also filled with fun things to do. These houses for sale are near the huge Newport News Park, one of the largest city parks in the nation. Visitors can camp, play, rent paddle boats and canoes, bike, practice archery, hike and more on this prime piece of real estate. This new construction neighborhood is also close to Yorktown Battlefield in Colonial National Historical Park. History and military buffs can learn even more about this important landmark as they tour the sites. Buying a new home in Oak Ridge gives buyers the opportunity to explore this rich countryside. Send me more information about communities similar to Oak Ridge. Our agents gladly offer FREE property tours of Oak Ridge, Yorktown and homebuyer consultations to all serious buyers. Our Yorktown SH Pro is prepared to represent you and your interests so you can move into your dream home.